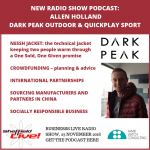 New radio show interview: Allen Holland on the Nessh Jacket, a high-tech jacket which smashed its crowdfunding target. For every jacket sold one is given to a person affected by homelessness. Plus manufacturing, product design, licensing and international business advice.